A Government Lurching From "Problem to Problem"
Canadair CF-104D Starfighter. Photo CWHM. While Phil Lapp and John Chapman worked on Canada's first satellite, the Canadian government seemed to lurch from one problem to the next. 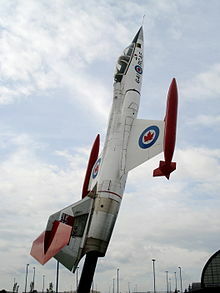 When the administration asked for aircraft industry proposals to update the CF-100s that were on-station in Europe, it was offered a choice of the new supersonic Lockheed F-104 Starfighter (which would be built by Canadair in Montreal) or the new vertical take-off Hawker P1127 which would be built by Avro in Malton. Both aircraft presented problems. Neither was adequate to protect or patrol Canada's remote regions and neither was ready for deployment. The F-104 was notoriously unforgiving in flight and soon earned itself the sobriquets "Jinx Jet," "Widowmaker" and "Flying Coffin". Meanwhile, the P1127 was only just getting off the ground as the world's first fighter jet capable of taking off and landing without a runway. The government chose to go for speed rather than dexterity and gave the contract to Canadair. Any chance that Avro might have had to regroup was now over. History would write the next chapters in this unfortunate mess. Canadair Plant One in Saint-Laurent, PQ, as seen from the air in March 1953, when it was producing forty F-86E fighters each month and ramping up production of the CT-133 Silver Star. The company began in 1944 as a subsidiary of another aircraft manufacturer, went on to become nationalized in 1976, then privatized in 1986 and finally absorbed by Bombardier after having experienced record losses during development of the Challenger business jet. Photo c/o Royal Aviation Museum of Western Canada. The F-104 would go on to kill pilots around the world at an unprecedented rate, while the P1127 would be deployed as the Hawker Harrier and is still in service today, making it one of the most successful aircraft to ever fly. 1959 also ended with the decision to equip Canada's domestic squadrons with the Douglas Voodoo, another supersonic fighter. The Voodoo couldn’t fly as high or as fast as the Avro Arrow, but its range far exceeded that being covered by the inadequate Bomarc missiles. Meanwhile, Canada's own big interceptor rocket finally took to the skies at Fort Churchill Manitoba. The Black Brant had entered space and began to return new information about the Canadian environment. The new decade began with Phil Lapp proposing to merge his Canadian Astronautical Society (CAS) with the Canadian Aeronautical Institute (CAI). Lapp was the founder of the former, and on the board of the latter. The core of the CAI had struggled to attract its members to space research and so the merger was seen as eminently logical. It took over a year before the "S" was inserted into the acronym and in October 1961 the Canadian Aeronautical and Space Institute (CASI) was formed. No wonder the public had concerns over the Bomarc missile. An account from the June 8th, 1960 issue of the Trenton Evening Times describing the explosive rupture of a Bomarc-A missile on-board helium tank at McGuire AFB on 7 June 7th, 1960. 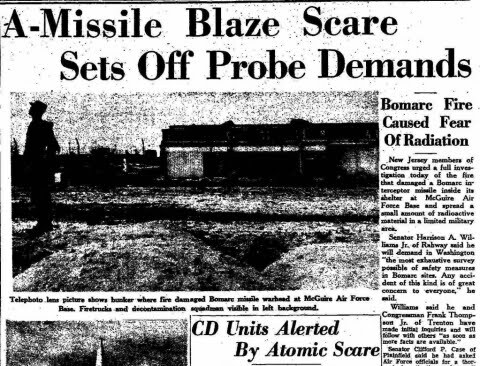 As outlined in the April 26th, 2011 Readex post, "The Bomarc Missile Plutonium Spill Crisis: Exercises in Propaganda and Containment in 1960 and Beyond," while the missile's explosives "didn't detonate, the heat melted the (nuclear) warhead, releasing plutonium which the fire crews then spread around. The Air Force and the Atomic Energy Commission cleaned up the site and covered it with concrete." Graphic c/o Trenton Evening Times. Meanwhile, in the spring of 1960 both the Bomarc and Britain's Blue Streak missiles fell on hard times. Despite Boeing's attempt to change Bomarc to solid fuel, which would theoretically make it always ready for launch, both were still seen as vulnerable. The new preference was to keep nuclear warheads mobile, either aboard large aircraft or submarines. The Cold War was getting more and more dangerous and Canada still needed something to defend its airspace, but the Prime Minister did not want to bring nuclear warheads onto Canadian soil unless absolutely necessary. The Voodoos were capable of carrying such weapons, as were the Bomarcs, but so far neither had been armed. The highly public government fiasco turned even worse when the Bomarc was cancelled by the United States government just over a year after the missile had been selected to replace the Avro Arrow. By 1962 the whole idea of being in the missile business had become so odorous it caused de Havilland to rename its missile division as "Special Projects." When Hawker Siddeley's offer to have Avro build the P1127 for Canada was rejected, the company decided to purchase de Havilland Canada. The merger which took place in December 1959 involved both the companies in England as well as Canada. The price paid for the entire global operation was $37Mln CDN. There was now no need for two advanced project offices and so de Havilland's "Special Projects" was merged with Avro's "Advanced Research" to form SPAR. 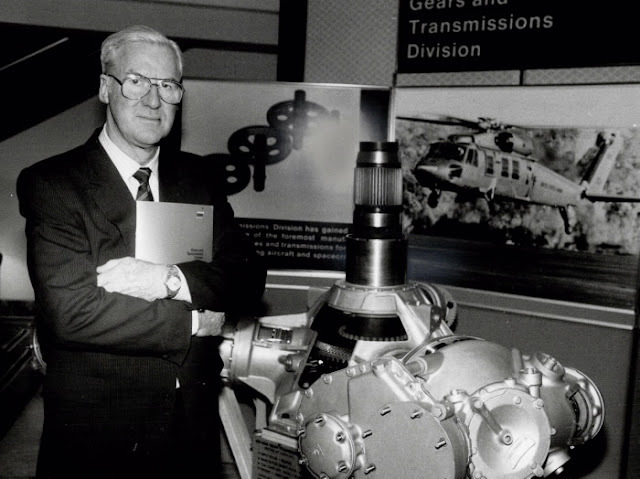 Spar Aerospace founder and longtime chairman Larry Clarke (1925 – 2015) beside a transmission for a Sikorsky UH-60A Blackhawk military helicopter in 1986. As outlined in his October 24th, 2015 Toronto Star obituary, "In 1967, he "led the acquisition of SPAR Aerospace Ltd. from de Havilland and as founder, president, and chief executive officer, built SPAR into a world-class space-technology company. SPAR was best known for the Canadarm designed for the Space Shuttle orbiters. As a result of this innovation, the country enjoyed a high profile within the US space program NASA. As a true visionary, Larry's commitment and dedication to developing Canada's aerospace industry provided opportunities for thousands of engineers." Photo c/o Virtual Reference Library. In an attempt to make use of all of the money that had already been spent on Blue Streak, in September 1960 the British government officially asked the Canadian government to join them in a joint Commonwealth space program but having just cancelled Bomarc, the cabinet in Ottawa was in no mood to get involved in another missile program. Ironically the choice to abandon cooperation left Canada with only observer status when it came to Britain and the United States' first serious attempts to design and build a trans-Atlantic communications satellite. Canada had been the first port of call for all trans-Atlantic communications since Kelvin had laid the first cable and Marconi had received the first trans-oceanic radio message. Now the next step in long distance communications, something which Canada knew how to do as well as any other country was being left to others. Leading the charge in England on this project was James Floyd, the repatriated chief engineer for the Avro Arrow. Once SPAR had perfected the long STEM antenna Canada's first satellite was ready to be built and tested. On September 29th 1962 Canada entered the space era when the Alouette was launched from Vandenberg Air Force base in California. Canada was only the third country to have a home-grown satellite in space and its stated task was to look down and study the earth's atmosphere. The STEM antenna deployed perfectly and performed so well that the US government asked that a set of STEMs be installed on its next manned Mercury spacecraft. Thus began the long history of one of Canada's greatest space exports. Canadian Prime Minister John Diefenbaker, with US President John Kennedy and British Prime Minister Harold Macmillan in the Bahamas in December 1962. Officially, Diefenbaker was scheduled to arrive in Nassau for talks with Macmillan following Kennedy's departure. However, as outlined by David Owen in his 1972 book, "The Politics of Defence," the Canadian PM arrived early, so Kennedy lunched with both Diefenbaker and Macmillan. Owen quoted Kennedy as stating, "There we sat like three whores at a christening." Photo c/o Getty. However, just a month after the launch of Alouette the United States' military went toe-to-toe with the Soviet Union in what became known as the Cuban Missile Crisis. President Kennedy managed to extricate the world from the precipice but in the meantime he had run out of patience with the government in Ottawa for still refusing to arm the Bomarcs and Voodoos with nuclear weapons. Compounding the problem was the fact that the British Blue Streak had been removed as a weapon in Europe on the understanding that it would be replaced by another untested missile, the Douglas Skybolt. The Skybolt was a stand-off weapon, designed to be deployed on a bomber and launched from a distance at its target. The British had cancelled Blue Streak and agreed to take Skybolt, only to then see Skybolt cancelled. With no replacement in sight the British Prime Minister urged Kennedy to give Britain the submarine launched Polaris, which he did. This left Canada sidelined with nothing but unarmed Bomarcs and Voodoos. Prime Minister Diefenbaker flew to a summit in the Bahamas with President Kennedy and British Prime Minister Macmillan, but his insistence on keeping Canada out of the nuclear club had agitated the young American President who chose to not discuss the subject further and instead set about explaining how Americans were going to get to the moon using something called "Lunar Orbit Rendezvous" or LOR. Robert Godwin is the owner and founder of Apogee Space Books, the Space Curator at the Canadian Air & Space Museum and an American Astronautical Society History Committee Member. Last Week, "Bomarc Missiles, The "Prevailing Wisdom" of Unaware Politicians, Unemployed Avro Employees, NASA, Canadair, CAI & the Origins of Spar Aerospace," in part six of "150 Years of Canadian Aerospace History." Next Week, "Stehling, Maynard, the Lunar Excursion Module, Gerald Bull, James Chamberlin & Phil Lapp" as part eight of "150 Years of Canadian Aerospace History" continues. On sale now, at Apogee Books. Space Station Freedom in 1991. Graphic c/o NASA/ Tom Buzbee. This paper, first presented at the 65th International Astronautical Congress, which was held in Toronto, Ontario from September 29th - October 3rd, 2014, is a brief history of the Canadian space program, written by two of the major participants. The motives behind the announcement were many, but one of the important objectives was to use space once again (reminiscent of the Apollo Program) as a measure of the free world’s superiority over the Soviet Union which already had a space station in orbit called Sayut and was well on its way to launching the Mir space station. The Russians were also allowing astronauts from East Bloc countries to fly on Russian rockets to the Russian space station. He designated James Beggs the Administrator of NASA as a Special Ambassador and had him meet with the appropriate officials in Europe, Japan and Canada in 1984. 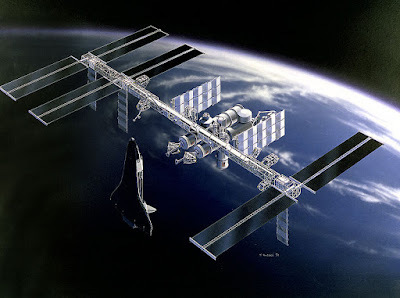 President Reagan raised the space station at the London G7 Summit in June 1984 and the resulting declaration endorsed the US space station initiative and included the phrase: “In that context each of our countries will consider carefully the generous and thoughtful invitation received from the President of the United States to other Summit countries to participate in the development of such a station by the United States.” This declaration committed Canada to consider participation in space station and to have an answer before the next Summit meeting in a year’s time. The US invitation to participate in space station came at a time when Canadian officials in the Interdepartmental Committee on Space (ICS) were struggling with Canada’s next space plan. On the table at the time were two programs that had already received preliminary approval and initial financing – Mobile Satellite (MSAT), from the Department of Communications (DOC) and RADARSAT, from the Department of Energy Mines and Resources (DEMR). Having arrived as a Heads of Government initiative, Canadian participation in space station was now added to this mix. Each of these programs would entail substantial new resources and the government was expecting the ICS to rank their relative priority. The debate raged at the officials’ level pitching adherents to the policy that Canada should use space to meet national needs (e.g. MSAT and RADARSAT) against those who recognized that space station would become the world’s major space initiative and if Canada was to be a full member of the G7, we had to participate. Canada’s commitment to participate in the space station was announced at the Shamrock Summit between Prime Minister Mulroney and President Reagan in March 1986. Thus, just two years after the initial invitation, participation in space station became Canada’s largest space program by far. It took two more years of international negotiations before the formal agreements amongst the partners could be signed on September 29, 1988, the day the shuttle first returned to flight after the Challenger accident. Graham Gibbs & Mac Evans. Photos c/o MyCanada & CSA. Graham Gibbs represented the Canadian space program for twenty-two years, the final seven as Canada’s first counselor for (US) space affairs based at the Canadian Embassy in Washington, DC. 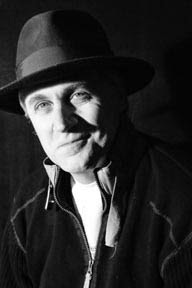 He is the author of "Five Ages of Canada - A HISTORY from Our First Peoples to Confederation." William MacDonald "Mac" Evans served as the president of the Canadian Space Agency (CSA) from November 1991 to November 2001, where he led the development of the Canadian astronaut and RADARSAT programs, negotiated Canada’s role in the International Space Station (ISS) and contributed to various international agreements that serve as the foundation of Canada’s current international space partnerships. He currently serves on the board of directors of Vancouver, BC based UrtheCast and as a member of the Federal government Space Advisory Board. Last Week: "The 1980's, A "National Space Agency," Canadarm's Rollout, The Second Three Year Space Plan & Canada's First Astronauts," in part six of "A History of the Canadian Space Program: Policies & Lessons Learned Coping with Modest Budgets." Next Week: "Long-Term Space Plan I, a National Space Agency, RADARSAT, Centralization and the Dramatic Increase in Government Space Expenditures," as part eight of "A History of the Canadian Space Program: Policies & Lessons Learned Coping with Modest Budgets," continues. Back in the day, if someone received a press release titled, "New funding to be announced for Canada's space program," which promoted an upcoming announcement from two senior members of the Federal cabinet, there would be a reasonable expectation that the announcement would include "new funding." Minister Bains at CSA headquarters in Longueuil, Quebec on April 27th, 2017. As outlined in his presentation, the technologies developed through Canada's space program "can be applied to the everyday lives of Canadian's" and "point to new ways of fighting climate change, The complete, twenty-five minute press conference is available online by clicking on the screenshot above. For those more interested in the formal, prepared text, it's available online as part of the April 27th, 2017 ISED post, "Canadian Space Agency Budget 2017 Rollout." Graphic c/o CSA. Of course, that not exactly the way things happened on Thursday in Longueuil, Quebec, when Innovation Minister Navdeep Bains got together with Transport Minister Marc Garneau, Parliamentary Secretary to the Minister of Innovation David Lametti and Canadian Space Agency (CSA) president Sylvain Laporte to "celebrate" existing CSA funding relating to quantum encryption and future missions to Mars, plus provide a "dedication to the Canadian space program." But they mostly forgot to announce anything new. As outlined originally in the April 25th, 2017 Government of Canada press release, "New funding to be announced for Canada's space program," the original intent of the April 27th, 2017 press conference seemed to have been to announce "new funding." But by the day of the event, and as outlined in the April 27th, 2017 follow-up press release, "Ministers Bains and Garneau celebrate $80.9 million for the Canadian Space Agency," the focus had definitely changed from "announcing" to "celebrating." One item that hadn't previously received wide publicity before today's press conference, but was referenced there by Minister Bains and is well worth taking a look at is the Canadian CubeSat project, a CSA challenge to post-secondary educational facilities to "Build and fly your own satellite." As outlined on the April 27th, 2017 update to the CSA's "Canadian Cubesat Project website," the CSA "will award up to 13 grants (of up to $200K each) to fund selected proposals to build a miniature satellite called a CubeSat. Teachers and students from every province and territory are encouraged to participate in this innovative project." But even this program can't exactly be called cutting edge or innovative given that several Canadian post secondary facilities have already embarked upon their own space programs. The University of Toronto Institute for Aerospace Studies (UTIAS) Space Flight Lab (SFL) has launched more satellites into orbit than the CSA over the last decade. As outlined in the March 27th, 2017 post, "UrtheCast, 3D Printing for Space, AlbertaSat & More on Reusable Rockets," the University of Alberta's AlbertaSat-1 is already safely in orbit on-board the International Space Station (ISS) being prepared for release and, as outlined in the April 3rd, 2017 post, "UofT Undergraduate Satellite Builders Raise Almost $500K to Build & Launch a Microsatellite in 2019," even small university based clubs are now capable of raising substantial sums of money for space projects, even without CSA assistance. Graphic c/o CSA. The largest portion of the press conference focused on March 2017 Canadian budget announcement that $80.9Mln CDN would be allocated over five years, starting in 2017 - 2018. As outlined in the March 27th, 2017 post, "Canada's Latest Space Budget; $81Mln for "New Projects" over Five Years Including a Contribution to NASA's Mars Orbiter," these funds were initially announced in March 2017 as part of the 2017 Federal budget and were widely known in the industry. Minister Garneau, looking memorable, but not saying much. Photo c/o CSA. The more recent press release went on to state that, "the funding will support new projects that will demonstrate and utilize Canadian innovations in space." A demonstration of the applications of quantum technology in space involving the Institute for Quantum Computing at the University of Waterloo. This project will position Canada as a leader in quantum encryption, which uses highly advanced computing technology to create virtually unbreakable security codes. This technology could lead to more secure communications, safer and more reliable government services, and greater protection of Canadians' privacy. It's worth noting that announcements from Federal ministers almost always come with context and antecedents which supersede and sometimes influence the base political process. Seen here is one of the antecedent studies which led to the decision to fund an "instrument" to be "used to study the surface and subsurface of the red planet." To view the complete presentation, simply click on the graphic above. Graphic c/o MIT. The press conference also referenced the ongoing search for Canada's next astronauts as described in the April 24th, 2017 post, "More on Canada's "Next Top Astronauts," Canada's "Failure To Scale" & Is Our Space Agency "Muzzling" its Contractors?" and the ongoing work of the new space advisory board as outlined in the April 20th, 2017 post, "Space Advisory Committee Members Announced: Various Stakeholders Release Independent Assessments, Just in Case." But there wasn't a lot of anything new going on during the press conference. It's not that there is anything wrong about our current government using the CSA and the majesty of science for political gain or re-announcing the same news a second time and pretending that the announcement is a new story. On second thought, it does sort of leave a bad taste in the mouth. Here's hoping that the governing Liberal party recovers quickly from this misstep. More on Canada's "Next Top Astronauts," Canada's "Failure To Scale" & Is Our Space Agency "Muzzling" its Contractors? There's nothing new under the sun and pretty much everything happening today is understandable when placed in the context of what's happened in the past. That's why this blog is currently running two historical series, by acknowledged Canadian experts, on "A History of the Canadian Space Program - Policies & Lessons Learned Coping with Modest Budgets," and "150 Years of Canadian Aerospace History." At least they're mostly not "striking a pose" or wearing heels. We're down to the "final seventeen," an important enough milestone to splurge on brown polo's and organize a group shot with the innovation minister (on the left, with his back facing the camera). A final decision on the two Canadian astronaut openings is expected to be announced sometime this summer. To view the complete April 24th, 2017 press conference, please click on the graphic above. Screenshot c/o CSA. As the hot PR winds continue to blow, Federal minister of innovation Navdeep Bains has announced the "final seventeen" candidates completing for the two open slots in the Canadian Space Agency (CSA) astronaut corps. As outlined in the April 24th, 2017 Global News post, "Final candidates unveiled as Canada searches for 2 new astronauts," the finalists now include "twelve men and five women, roughly reflecting the ratio of men to women who applied to the program." A complete listing of the remaining seventeen candidates are available online on the CSA "Who are the astronaut candidates?," webpage. The competition, being run by the CSA, began last year with over 3,700 applications received. That field was initially reduced (with much fanfare) to seventy-two, and then reduced again earlier this year to thirty-two candidates. The expectation is that the final two successful applicants will be chosen later on in the year, again with much fanfare. As part of the presentation surrounding the latest unveiling, Minister Bains noted the $379Mln CDN the Federal government allocated to International Space Station (ISS) activities in 2016 (which covers costs through 2024 and was originally announced by the previous government), the $80Mln CDN the Federal government allocated to new space projects in 2017 and the ongoing activities related to the space working group, which began meeting just two weeks ago to assess potential, future space projects. As outlined in the 2016-17 Report on Plans and Priorities, published yearly by the CSA, the current CSA base budget (the amount of money required to keep CSA employees on staff and CSA buildings open and functioning even without any activities, exploration or science being undertaken) is $300Mln CDN annually. The cover page of the April 2017 Impact Brief on "Canadian Tech Tortoises; Is a lack of spending on marketing and sales delaying fundraising?" Graphic c/o Impact Centre. Are Canadian start-ups unable to scale into large corporations? A recent study from The Impact Centre at the University of Toronto seems to think so and might have even suggested a reason why. As outlined in an April 24th, 2017 e-mail from Charles Plant, a senior fellow with the Impact Centre, "anecdotal evidence suggests that many Canadian technology companies wait until their products are launched before spending funds on crucial functions such as marketing and sales and that this practice is delaying growth and success in fundraising." The key component missing from Canadian start-ups seems to be that "Canadian firms have significantly fewer employees in marketing and sales functions than US firms do," at least according to Plant. Plant and his colleagues also found that, "even among the best funded firms, Canadian technology firms have 25% fewer marketing and sales employees than US based Unicorns do. This lack of emphasis on marketing and sales may be delaying and impeding rapid growth and our companies' ability to get funding to scale to world-class status." The complete April 2017 report, under the title "Canadian Tech Tortoises; Is a lack of spending on marketing and sales delaying fundraising?" is available online at http://www.impactcentre.ca/wp-content/uploads/2015/05/170421-Tech-Tortoises.pdf. A bipartisan reminder, courtesy of the April 30th, 2012 Ottawa Citizen Post, "Agency's Long-term plan years overdue," that the Canadian government space program has been drifting for decades, even as our private space sector activities took off. But at least we've been allowed to publicly assess our flaws, right? Well... Maybe not. Graphic c/o PressReader. Has the CSA "muzzled" its contractors? The latest CSA request for proposal (RFP), posted on the Federal government Buy and Sell procurement website, suggests that it has. As outlined on the April 24th, Buy and Sell posting, "Radio-Frequency (RF) Communication Contribution Concept Study (9F050-16-0974)," the CSA has issued an RFP for a single contract, "for an all-inclusive budget not to exceed $400,000.00 CDN (excluding any applicable taxes)" covering "potential solution for an RF communications contribution." The attachment to the solicitation document (CSA-DSTRF-SOW-0001) under the title, "Post-ISS Human Spaceflight Contributions – Deep Space Telecommunications (DST) RF Concept Study," goes into a little more detail on the nature of the work the CSA is contracting. As outlined in the document, the RFP is to help define concepts for "collaborative Beyond Low Earth Orbit (BLEO) Missions" as defined in the NASA global exploration road map, which is being developed by space agencies participating in the International Space Exploration Coordination Group (ISECG). Not that there's anything wrong with that. It's good that our space agency is co-operating with others to generate useful plans for activities after the ISS winds down. The main page of the ISECG website, a forum set up by 14 space agencies (including Canada's CSA) to "advance the Global Exploration Strategy through coordination of their mutual efforts in space exploration." Screenshot c/o ISECG. But there sure seems to be some onerous restrictions on how CSA subcontractors can go about discussing their contributions to this program. As soon as the Contractor intends to organize a Communication Activity, send a Notice to the CSA’s Directorate of Communications and Public Affairs. The Communications Notice must include a complete description of the proposed Communication Activity. The Notice must be in writing in accordance with the clause Notice included in the general conditions applicable to the contract. The Communications Notice must include a copy or example of the proposed Communication Activity. The contractor must provide to the CSA any and all additional document in any appropriate format, example or information that the CSA deems necessary, at its entire discretion to correctly and efficiently coordinate the proposed Communication Activity. The Contractor agrees to only proceed with the proposed Communication Activity after receiving a written confirmation of coordination of the Communication Activity from the CSA’s Directorate of Communications and Public Affairs. The Contractor must receive beforehand the authorization, approval and written confirmation from the CSA’s Directorate of Communications and Public Affairs before organizing, proceeding or hosting a communication activity. These clauses makes it essentially impossible for CSA subcontractors to talk to the public without either the formal approval of the CSA Directorate of Communications, unless they are willing to run the risk of becoming non-compliant with their CSA contract. This is similar to the actions of the previous Stephen Harper conservative government as outlined in the November 6th, 2015 Huffington Post report, "Liberals Unmuzzle Canadian Scientists, Promise They Can Now 'Speak Freely.'" It's also an activity the current Justin Trudeau Liberal government had insisted was done away with when they took office in 2015. Newly minted innovation minister Navdeep Bains at a press conference on Parliament Hill on November 6th, 2015 where he fulfilled a Liberal party campaign promise to allow government scientists and experts to comment on their work to the media and the public. Hopefully, he'll also do the same for our space agency. Photo c/o Adrian Wyld/CP. Oddly enough, similar clauses are also included in other recent CSA documents posted on Buy and Sell, such as the April 19th, 2017 "Development of enabling space technologies (9F063-160953/A)" notice of proposed procurement (NPP) and the April 5th, 2017 "Dextre Deployable Vision System (DDVS) – Phases B/C and D (9F052-160487/A)" NPP. This blog has requested clarification on those contract clauses and the reasons for their inclusion in CSA documents and will update this post as new information becomes available. For more, check out our upcoming stories in the Commercial Space blog. Bomarc. Photo c/o Canadian Aviation and Space Museum. 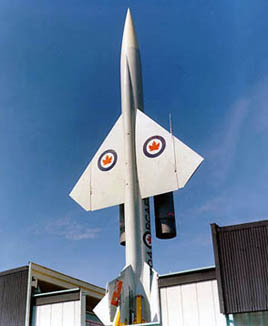 The Avro Arrow was to be replaced by a surface to air missile, built by Boeing in the United States, named the Bomarc. The Bomarc was a liquid fueled interceptor with a static launching site and a limited range. It was also designed to be equipped with a nuclear warhead. At the moment that Canada committed to this weapon for its defence, the prevailing wisdom was already changing in the United States and the Soviet Union, against the usefulness of static-site liquid fueled rockets. They were considered easy targets and they took too long to prepare for launch. In the Soviet Union even rocket genius Sergei Korolev was struggling to convince Nikita Khrushchev that the rocket which had launched Sputnik was useful as a weapon. In England, Geoffrey Pardoe, one of the principal designers of Britain's Blue Streak was fighting a similar fight with British Prime Minister Harold Macmillan. However, in the United States dozens of contractors were still lining up to build missiles. The new technology of rockets was outpacing the social awareness of the politicians in charge of commissioning them. At the exact time that 13,000 Avro employees went in search of employment, the United States government was looking for aerospace engineers to come and help its newly formed National Aeronautics and Space Administration (NASA) to put a man into space. Within weeks of the Avro lay-offs dozens of engineers headed south of the border and took up positions at NASA, McDonnell, Douglas, Boeing, Bell, Grumman and elsewhere. Many went back to England where they were employed by de Havilland and Hawker Siddeley. The main beneficiary of this "brain drain" was NASA where people like James Chamberlin, John Hodge, William Carpentier, Len Packham, Owen Maynard and two dozen others took up positions in the fledgling American space program, often as department heads. Over the next ten years they would play an important role in putting humans on the moon. Just four days after the cancellation of the Arrow, the Black Brant was fired for the first time on a test stand in Valcartier. The cancellation of Arrow represented something of a windfall for Canadair. The management at the Montreal based company now knew that it had another chance to bid on the construction of Canada's next generation of fighter aircraft. Canadair had flourished all through the 1950s building more than 1500 variants of the North American Aviation Sabre fighter. At about the same time de Havilland had been building the Grumman S2-F Tracker anti-submarine aircraft. 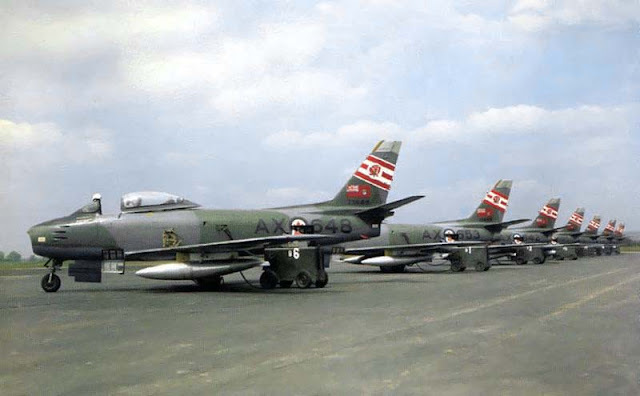 Sabres of 421 Squadron Royal Canadian Air Force at RCAF Station Grostenquin, France in the 1950's. The Canadair Sabre was a jet fighter aircraft built by Canadair in Montreal, PQ under licence from North American Aviation. According to the wikipedia entry, "a variant of the North American F-86 Sabre, it was produced until 1958 and used primarily by the Royal Canadian Air Force (RCAF) until replaced with the Canadair CF-104 in 1962. Several other air forces also operated the aircraft." Photo c/o Canada's Air Forces, 1914–1999. The CAI barely acknowledged the huge loss of jobs at Avro and began to encourage more cooperation with the United States, both for fighters and for space. In early March 1959, in response to the notion that Canada should join in on a Commonwealth space program, Herbert Ribner of the CAI expressed his opinion that Canada would be better to ally itself with the USA. Less than a month after that, in April 1959, the Diefenbaker government announced its intentions to design a satellite to be launched by the United States. At first it was expected that the satellite would be built in the USA, with the stated intention that it would be used to probe the upper atmosphere from above. If it could be built and launched successfully the satellite was expected to reveal hitherto unforeseen insights into the nature of the ionosphere and perhaps resolve some of the problems with long range communications that had been dogging governments for generations. Two weeks later the British government announced its intention to follow Canada's lead and launch its own space program with the help of the United States. Canada's first real satellite was proposed by John Herbert Chapman of the NRC in Ottawa. Chapman knew that to be able to study the ionosphere from above, his satellite would need to operate in a frequency range that would require extremely long antennae. Chapman knew Phil Lapp, who was still at de Havilland's missile division in Downsview Ontario, so he contacted him and suggested that he visit the office of George Klein who worked near to Chapman at NRC. Klein had devised a clever device which could be used as an antenna but could also be packed into a very tight space. This so-called STEM antenna could be deployed without any overly complicated mechanisms. It was perfect for space projects. The Canadian built STEM antenna used in the Alouette-1 satellite. The compact, flat, but flexible metallic bar unrolls and bends inward to become a rigid cylinder able to be used as a satellite antenna. Photo c/o Canadian Science and Technology Museum (CSTM) collection #1992.0357.00. Klein was another graduate of the University of Toronto. He was born in Hamilton in 1904 and by the time he was 39 he had already earned an MBE from King George. Klein had an uncanny knack for invention and in July of 1951 he had been returning from a trip to England aboard the Cunard ship Franconia when he had what was perhaps his greatest idea. Evidently Klein liked to roll his own cigarettes and it was while standing on the deck of the Franconia he rolled up a cigarette paper and had a revelation. 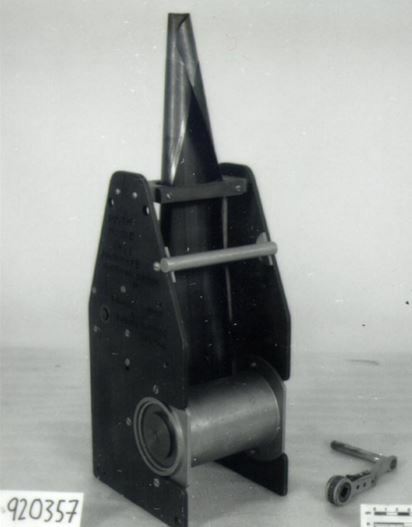 It had occurred to him that he could make a similar roll-up device out of metal which might be a useful remedy to a problem that he had been given to solve. What was needed was an antenna which could be dropped out of an aircraft over rugged terrain, or even water, and be used to send back data. Working with another NRC genius named Harry Stevinson, Klein concocted a workable device which would ultimately lead to the black box concept seen in most of today's modern aircraft. Lapp studied Klein's invention and took it back to de Havilland where the engineers went to work to make a version that would be long enough for Chapman's satellite. This innocuous device would become so successful it would go on to create an aerospace industry behemoth – SPAR Aerospace. Last Week, "The International Geophysical Year, the Avro Arrow & Jetliner, Lapp, Stehling, Bull & Blue Streak" in part five of "150 Years of Canadian Aerospace History." Next Week, "A Government Lurching From 'Problem to Problem,'" as part seven of "150 Years of Canadian Aerospace History" continues. Scan c/o Globe and Mail. In late 1979 and early 1980 the Ministry of State for Science and Technology (MOSST) and the Air Industries Association of Canada (AIAC) independently analyzed the existing approach to space in Canada and both concluded that there were weaknesses that limited the scope and benefits of the program. Both also concluded that correction of these deficiencies was essential to the more efficient and effective use of the government’s space resources. The AIAC argued strongly for the formation of a national space agency. In response to these concerns, the Prime Minister in July 1980 assigned to MOSST “the leadership role with respect to space policy and development” and transferred responsibility for the Interdepartmental Committee on Space (ICS) from the Minister of Communications to the Minister of MOSST. 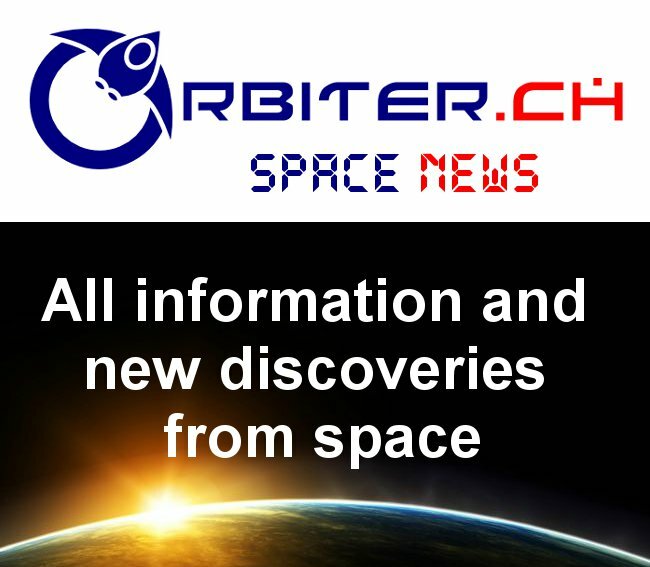 Thus, in 1980, MOSST became the lead agency in the areas of space research and development, policy development, and coordination of space activities among government departments and agencies. In April 1981, John Roberts, the Minister of State for Science and Technology announced a three-year space plan for Canada (1981/82 to 1983/84). This was the first time that a consolidated space plan had been considered by the government. The plan was aimed at building upon Canada’s strengths to use space for communications and science, while at the same time developing a major new thrust in the area of remote sensing. As outlined in the April 9th, 1981 United Press International (UPI) post, "Science Minister John Roberts Announced an Increase in Federal Funding for Space Research," Canada's first three year space plan was part of a proposal to centralize Federal space activities into a single agency, while also providing a funding increase for space and other areas of scientific research in order to assist with moving the plan forward. Roberts proposed a $64Mln CDN increase (to $260Mln CDN) for space research, along with a further increase of $200Mln CDN (to $1.5Bln) in all other areas of Federally funded scientific research and development. Screenshot c/o UPI archives. More than 60% of the new funding of $64Mln CDN was dedicated to remote sensing projects including a new basic R&D program to give Canada the technological and industrial competence to develop and establish a remote sensing satellite carrying a synthetic aperture radar (which eventually became known as RADARSAT). In making his announcement, Mr. Roberts indicated that it was the government’s intention to update the three year space plan every year. The morning of Friday, November 13, 1981, yielded a great emotional moment of pride for all Canadians. Shortly past 10:00 a.m. EST on that date, a majestic sight was broadcast on every television screen around the world. Through the aft window of shuttle Columbia, a video camera operated by the two STS-2 astronauts, Commander Joe Engle and Pilot Richard Truly had begun to transmit the first images of the deployed Canadarm. The arm, bent in an inverted V shape position, shined against the jet-black background of space, under a milky blue portion of the earth. The Canada wordmark with the red maple leaf flag prominently displayed on the upper arm boom of the Canadarm were a proud and clear statement about Canada’s official contribution to the Space Shuttle program. Canadarm quickly became the icon around the world for Canada’s high technology capabilities. The importance of the Canadarm to the Shuttle Program is indicated by the fact that this first flight of the arm took place on just the second Shuttle flight. In December 1981, Mr. Roberts announced the government’s second three-year space plan (1982/83 to 1984/85) that in essence added one more year to the previously announced plan. This new plan increased the government’s expenditures on space for these three years by 38% and included Canadian participation in the L-SAT Communications Satellite Program of ESA (justified on the grounds that it would support the prime contractor policy) and project definition studies for a new communications satellite program (MSAT) to provide communications services to mobile users anywhere in Canada. In 1982, on the occasion of the 20th anniversary of the flight of Alouette I, NASA extended an invitation for Canada to fly its own astronauts on the Shuttle. This offer was clearly seen as a “thank you“ to Canada for providing the Canadarm. The government recognized immediately the significance of this offer and National Research Council (NRC), as the only organization in the government with human space flight experience, was assigned responsibility to establish the Canadian Astronaut Program Office. The NASA offer was for two payload specialist flights, but NRC had ambitions to ensure Canada would be ready for additional flight opportunities, including flights to the space station that was on the drawing boards at NASA. 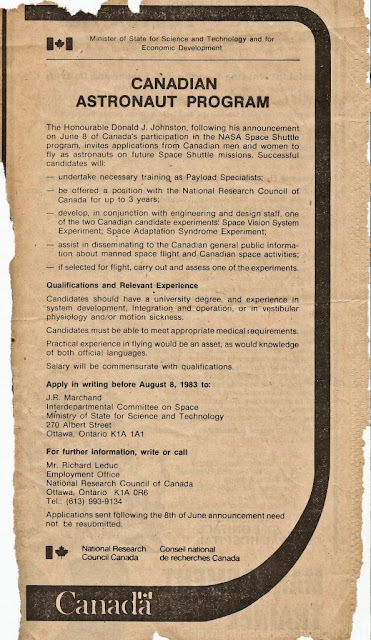 In July, 1983 NRC placed an ad in Canadian newspapers seeking candidates. A 1983 help wanted ad. Image c/o Ron Riesenbach's Blog. Canada’s first six astronauts were announced in December, after a country-wide competition involving more than 4400 applicants. Ten months later, in October 1984 Marc Garneau became the first Canadian to fly in space. A little over a year later, the Shuttle that had taken Marc into orbit exploded on launch killing all seven astronauts on board. It is interesting to note that Canada entered the human space flight arena primarily to support the Canadian Space industry. There was no Canadian user need for either the Canadarm or the Astronauts, but the space industry needed a major program to follow-on to CTS. But public reaction to the Canadarm and the astronaut programs was so positive and so strong that these one shot efforts created the policy imperative to make human space flight a permanent part of the Canadian Space Program and would lead eventually to the creation of the Canadian Space Agency. He currently serves on the board of directors of Vancouver, BC based UrtheCast. Last Week: "Winding up the 1970's, The Canada Centre for Remote Sensing, Spar Aerospace, MacDonald Dettwiler, a Seminal 1974 "Canadian Policy for Space" & the Canadarm," in part five of "A History of the Canadian Space Program: Policies & Lessons Learned Coping with Modest Budgets." Next Week: "The 1980's, Reagan, Space Station Freedom and the Debate Over National Needs vs. International Partnerships," as part seven of "A History of the Canadian Space Program: Policies & Lessons Learned Coping with Modest Budgets," continues. With almost no fanfare in either the mainstream media or amongst the Federal government, but with a great deal of confusion from the Ministry of Innovation, Science and Economic Development (ISED), the Federal government department tasked with administering its activities. the members of the long awaited space advisory board were finally announced last Tuesday evening. Industry minister James Moore at the 2014 Canadian Aerospace Summit and his successor, innovation minister NavDeep Bains at the 2016 edition of the same event. As outlined in the November 19th, 2014 post, "Industry Minister Moore Announces Space Advisory Board Members," the membership of the space advisory board was long-awaited even in 2014, when Moore appointed Colonel Chris Hadfield, retired general and former CSA president Walt Natynczyk and others to the original committee. However, the 2014 board never issued a report and so the search for a new board was announced by innovation minister Bains in November 2016 at the 2016 Aerospace Summit. The creation of a space advisory board was one of the recommendations of the November 2012 Federal Review of Aerospace and Space Programs and Policies (or "Emerson Report") which was presented to another industry minister, Christian Paradis, in November 2012. Photo's c/o Chuck Black & Brian Orlotti. ... engage with Canadians to develop a new vision for Canada’s space sector and define key elements of a strategy that will be launched this summer. The advisory board’s input will inform the strategy, which will focus on using space to drive broader economic growth and innovation, while inspiring the next generation of space scientists. Dr. James Drummond, a professor at Dalhousie University. William MacDonald Evans, a past president of the Canadian Space Agency (CSA) who currently acts as a director for Vancouver, BC UrtheCast and is one of the two authors of the multi-part series on "A History of the Canadian Space Program: Policies & Lessons Learned Coping with Modest Budgets," which is currently being serialized on this blog. Stéphane Germain, the president and CEO of Montreal, PQ based GHGSat Inc.
Dr. Douglas Hamilton, a clinical associate professor of internal medicine and adjunct professor of electrical engineering at the University of Calgary. Michelle Mendes, the executive director of the Canadian Space Commerce Association (CSCA). Dr. Gordon Osinski, an associate professor at Western University and the Natural Sciences and Engineering Research Council (NSERC) industrial research chair in planetary geology. Michael Pley, a last president of Cambridge, Ontario based COM DEV International before it was purchased by New Jersey based Honeywell International Inc. in 2016 and the current chair of the Aerospace Industries Association of Canada's (AIAC) space committee. Dr. Afzal Suleman, the Canada research chair in computational and experimental mechanics, a professor in the department of mechanical engineering and the director of the Centre for Aerospace Research at the University of Victoria. Christine Tovee, an independent consultant who was once chief technology officer for Airbus, North America. A reminder that one of the real issues currently preoccupying the Canadian government is whether it should continue supporting at least one Canadian based contractor capable of building large, multi-function Canadian military satellites like RADARSAT-2 and the upcoming RADARSAT Constellation or open future competition to lower cost, international bids. The March 29th, 2017 SatCom Frontier post, "Commercial Space Operators to Canada; 'We're Here and We can Help,'" argues that large, international satellite providers like Intelsat General Corporation are able to assist with complex military programs like the proposed Enhanced Satellite Communication Project (ESCP). 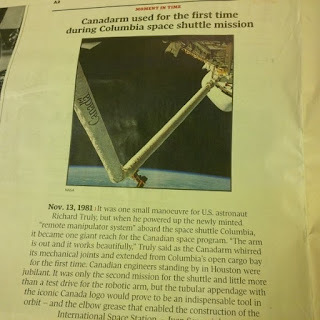 For a contrary view on this issue, its worth taking a look at the April 9th, 2017 post, "Part 4: A History of the Canadian Space Program - Policies & Lessons Learned Coping with Modest Budgets," which focused on "the 1970's, "Equal Access" to Communications, "Improved Industrial Capability" and the Hermes Communication Satellite" and was even co-written by one of the new members of the current space advisory board. Graphic c/o Intelsat General Corporation. The new members replace others appointed by the previous government to the same board in 2014. That board never issued a public report or held any public meetings. The new board is expected to engage in a process similar to the methodology employed during the "massive" review of Federal science funding which wound up last week. As outlined in the April 17th, 2017 post, "'Massive' Review of Federal Science Funding Finally Released; Will Likely Soon 'Drop Down the Memory Hole,'" that review seems to have achieved less than stellar results and might not be a good model to emulate. The only real surprise expected to come out of this review (and how's that for irony) could be an acknowledgement that foreign companies like Airbus and Intelsat General Corporation might soon be able to bid on large Canadian space projects. This is especially likely given the inclusion of Pley and Tovee on the board, although the debate on this particular issue originated in the early days of Canada's space efforts. Some organizations are willing to lobby the Federal government even without the bully pulpit provided by the space advisory board. An example would by the 8th Joint Planetary and Terrestrial Mining Sciences Symposium (PTMSS) and Space Resources Roundtable, which will be held in conjunction with the 2017 Canadian Institute of Mining (CIM) Convention in Montreal, PQ and promises "major announcements" from international space mining companies. Event organizers, such as Deltion Innovations CEO Dale Boucher have long advocated the use of tax credit system currently used in the mining, to grow the Canadian space industry. Boucher was last profiled in the April 10th, 2016 post, "Deltion Innovations Receives Gov't Funding to Develop Multi-Tool for Space Mining; Will Anyone Buy It?" For more on the mining industry and how it could drive space exploration, check out the July 30th, 2012 CSCA submission to the Aerospace Review, "Using Tools from the Mining Industry to Spur Innovation and Grow the Canadian Space Industry." Graphic c/o Deltion Innovations. Besides, as recently as a few years ago, Canada had two domestic firms capable of building large satellites. However, as outlined most recently in the April 19th, 2017 post, "American MDA Subsidiary Promotes "DEXTRE" for US as NASA RESTORE-L Satellite Servicing Budget Slashed," Richmond, BC based MacDonald Dettwiler (MDA) is currently hunting US government and Defense Advanced Research Projects Agency (DARPA) contracts, which subjects the company to many of the same US export licencing regulations that delayed the launch of RADARSAT-2 for almost seven years, and currently causes concern among those responsible for developing Canadian policies relating to northern sovereignty. Also, in February 2016, common shares of Cambridge, Ontario based COM DEV International were de-listed from the Toronto Stock Exchange (TSX) as the iconic Canadian company finished up its final task of becoming a subsidiary of US conglomerate Honeywell. However, nothing is ever certain in politics or in political committees. Board member Evans has often argued publicly for a policy of "capacity building" which would favor specific Canadian companies with additional funds and tax benefits to allow them to compete with large foreign multinational competitors, who typically also receive subsidiaries from their national governments. Evans argues that the creation of a domestic space industry outweighs the up-front costs associated with "capacity building," and supports the growth of domestic expertise and industry. The Canadian Senate isn't waiting for the space advisory committee to issue a report when it can issue its own. As outlined in the April 19th, 2017 Space News post, "Report: Canada should work with U.S. to protect satellites as “critical infrastructure,” a report from the Senate’s Standing Committee on National Security and Defence and Security advocates the designation of "satellites and radar installations as critical infrastructure and seek ways to secure the full spectrum of all critical infrastructure assets against significant threats, including electromagnetic pulse, by 2020 in partnership with the United States and other countries." The article notes that the Canadian Space Agency (CSA) has long been advocating this approach. Screenshot c/o Space News. Support for the new space advisory board, at least among the Federal government departments likely to be the most affected by any final report, seems tentative at best. For example, the Canadian Space Agency (CSA) is in the midst of a series of announcements related to the development of technologies they expect to utilize over the coming years and have been doing this without any guidance from the space advisory board. As outlined most recently in the April 3rd, 2017 post, "The Canadian Space Agency is "Very" Cautious About Its Post ISS Role," and the April 19th, 2017 More Space News post, "The Canadian Space Agency has just announced 15 more "priority technologies" it wants to develop," the CSA already has a strong, if also strongly conservative, sense of where it wants to go over the next decade. There is also some question about whether the Department of National Defense (DND) is on-board with the new board. As outlined in the April 17th, 2017 post, "An Update on NS Rockets, Intelsat Hunting for Canadian Gov't Satellite Contracts & More Ukrainian Lybid News," DND is pushing its own military space program, the proposed Enhanced Satellite Communication Project (ESCP), and the new project is likely out of the scope of the space advisory board mandate. Professor Ram Jakhu, the associate director of the Centre for Research of Air and Space Law at McGill University, was one of two authors of the February 17th, 2017 "Independent Review of the Remote Sensing Space Systems Act." The report makes a number of recommendations directly relevant to the mandate of the new space advisory board but there was no plans from the Federal government to release the report for public comment. Fortunately, and as outlined in the April 20th, 2017 SpaceQ post, "Exclusive: A Review of Canada’s Remote Sensing Law Recommends Creating a New General Outer Space Act," that review is now open to public perusal. The report and other issues relating to it, will be the topics of discussion when Jakhu and the Centre hold the 5th Annual Manfred Lachs International Conference on Global Space Governance, which will be held in Montreal, PQ from May 5th - 6th. Hopefully, someone from the space advisory board will also be there. Photo c/o McGill University. It's also worth noting that, while the space advisory board members are expecting to hold a series of town halls across the country to solicit feedback and assist with the development of useful policy, the secretariat supporting the space advisory board has so far refused to confirm or deny any activities the committee could possibly be conducting, except for one meeting taking place in Ottawa on Friday, April, 21st. Here's hoping that they organize a few more meetings after that first one. There's a lot of data to collect and some actual activities culminating in a proper, publicly available report would certainly be an improvement over the last time.